Let’s get one thing clear up front. 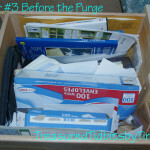 If you are looking for a home out of “Better Homes and Gardens” or any other magazine, this is not the blog post to see. We are a regular family with three teens, five cats, one dog and a gift for collecting things, and those things have accumulated. Many of them in our master bedroom. 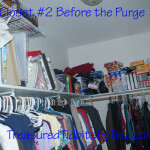 If you are brave enough to continue- Bless You and enjoy a true look at our master bedroom and closet. 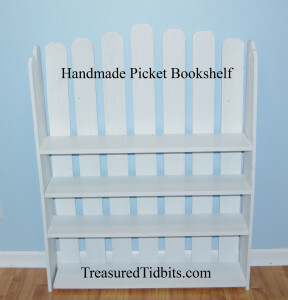 Sorry, I can’t bring myself to be one of those bloggers who makes everything perfect for their pics- unless I am trying to demo an item, and then I will “create” a perfect shelf or area to spotlight it. Yes, we have almost every available surface stacked with something. This is honestly how my bedroom looks most days. Sometimes a little better, sometimes a little worse. 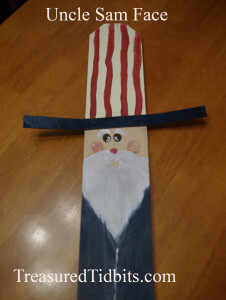 We use the master bedroom as a catch all, craft room, shipping area, office and storage facility. I require that the main areas of our home remain as clutter free as possible, but since it is often hard for me to maneuver the stairs, we bring up items I will need, and store them here. Since we are organizing the entire house instead of small sections, I was able to completely empty the bedroom, closet and desk. I am not going to say that everything is precisely where it belongs outside this room. But, I can say that everything we removed from this bedroom has been sent to the room it belongs in and will be properly put away by Friday evening. I like to work in a pattern so I began at the left of the door and worked around to the right. Meaning, my desk was the first thing I tackled. 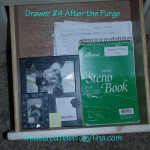 Normally, I simply clean out one drawer at a time and tend to scoot things from one drawer to another or only complete part of the paperwork stashed inside. This time was different. 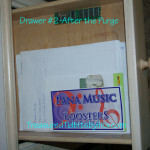 Here are the before and after pictures of my four desk drawers (embarrassing) but done. YAY me! 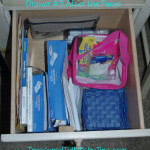 Please ignore the fact that two drawers are labelled drawer #3 twice. 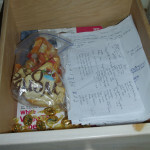 As you can see, drawer number #3 was even used to store snacks and candy (not for me, but for the kids), not anymore. As disastrous as these were, I could tell you 90% of the time exactly where things were. I will no longer have stacks of receipts stacked on the desk until I add them to the spreadsheet (they belong in the top drawer with papers I will need to handle again). 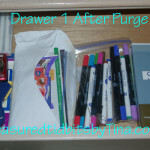 The center drawer now holds all my scrapbooking pens and current photos. The second drawer continues to hold both small and large envelopes, phone books, stamps and return labels, rummage sale supplies (in the pink basket), and now office supplies in the blue basket. 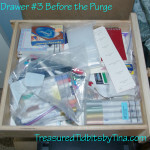 The bottom drawer holds projects and upcoming blog ideas and notes. Yes, this is brutal honesty. 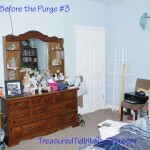 No, we didn’t stage it to make it look like an episode of hoarders or so the “purge” will look better. We have just been tossing items in here for the past few weeks without paying much attention to where they landed, knowing that I would straighten it up sooner or later. 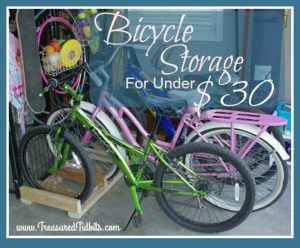 Yes, you do see a little bit of everything in here: scrapbook supplies, shoes, groceries, toys, equipment, books, boxes, packing material, etc… As I said, we use our room to keep items handy so that I don’t have to continually use the stairs. We do have an organization system in place, but you can’t see it for all the other “stuff”. As far as clothes go, this closet houses winter coats (when out of season), formals, everyone’s “dressy clothes” and clothes that my daughter and I share. I don’t like things in drawers (bending=discomfort), so almost every clothing item we own is on a hanger. A break down of what you see, what we kept in the closet and what we took away now that I have MUCH better storage in the basement. The first photo does not have a before shot, but it is located directly behind the door. We brought in the picture frame from the bedroom (I have had this for 3 months or more, waiting to be filled with current photos). We left the walker, two folding chairs and wooden Tv tray here. (I occasionally need the walker when my legs and hips won’t support me, and for around the house it is much easier than using crutches.) Hooks on the door keep my robes, purses, bags and belts accessible, while the wall hooks hold additional belts, sun hats and some of my husband’s things. The second photo shows the reorganized top shelf. We only removed a few items that were present before, and then reorganized and added all the groceries and some more scrapbooking supplies. For those of you who wonder why we have cereal, snacks and sodas in our room. My kitchen cabinets are small, I have three teenagers and I like to buy on sale. Most of the cereal cost less than 50 cents a box, the snack cakes were less than a $1.00 a box and the chips and soda were each less than $2.00 and $2.50 respectively so I bought several. If I leave them in my kitchen- certain unnamed individuals will eat ALL of the items they like in a day or two. 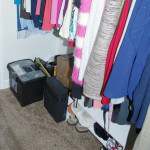 By storing them in my closet I am able to keep a better eye on how quickly things are consumed and monitor healthy eating. I’m not certain you can see them, but we currently have three cloth baskets with labels. 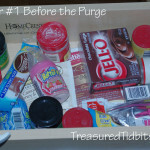 One for each of the following: loose snacks, Music Booster paperwork, and braces/ slings. Each of us girls have one brace/sling for every joint, and this basket makes keeping them in one location doable. The closet floor can now actually be seen. (Shock!!!) My hubby came home from work, and being the sarcastic man that he is said, “What is that brown stuff covering the floor?” He was referring to the carpet. Thanks babe! With the new storage downstairs, we were able to remove all but one of the packing boxes, all the books and a few decor items that were laying around. We also eliminated some shoes and articles of clothing to the rummage sale pile. We kept the file system (which was hiding in my room earlier), the ebay/craigslist box (which was also in my room-not hiding), a scrapbook organizer, one packing supply box, one shoe shelf (with soda on top and house shoes and flip flops inside), one shoe rack (with our dress shoes), the DVD rack and my husband’s loose shoes across the floor. Please don’t think I completed this on my own. My girls assisted by carrying things from the closet, running things to other rooms, shredding papers and carrying items downstairs. 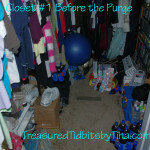 Then, when hubby came home after work, he felt guilty and removed all his loose items, too. (Big Smile.) 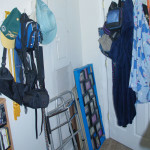 When I asked him where he moved his things to he answered, “somewhere” downstairs…..
Oh well, I guess I will find out on Friday when I tackle those rooms. 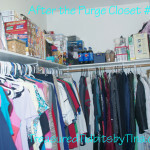 The entire “purged” room and closet is kind of eerie. My daughter actually came out of our room last night and said “Mom, I can’t stand to be in your room. It’s too, too neat. There’s nothing to walk around.” Um, what do I say to that? I have had the same feeling every time I entered my closet in the last 24 hours. I’m happy it is done, but it will take some getting used to, that’s for sure. 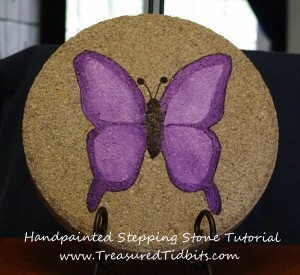 Want to see more from Treasured Tidbits? Follow us on Pinterest, Instagram, Facebook and sign up to receive weekly emails.